We urge the European Commission to stop the use of high risk fuels like palm oil in the EU that destroy our forests and kill orangutans. By February 1, 2019, we demand that the Commission through a delegated act carries out the the EU Parliament’s vote to stop subsidising palm oil diesel. The EU subsidises it as “green biodiesel” even though it’s actually three times worse for climate change than regular diesel because of the deforestation it causes. Large areas of forests in Southeast Asia are being cut down to make room for crops like palm or soybean oil. In turn, tons of carbon dioxide gets released into the atmosphere, contributing to climate change and making the region warmer. The good news is that the EU has a chance to stop deforestation from palm oil production and help save orangutans. Last year, the EU Parliament voted to stop subsidising crops like palm oil in diesel. The vote aims to gradually decrease and phase out the use of “high risk” fuels like palm oil in the EU by 2030. But to make this happen, the European Commission needs to implement this decision with a legal act by February 1, 2019. All over Europe, we need to make our voices heard by the Commission to ensure that we no longer burn palm oil in cars, destroying our forests, contributing to climate change, and killing orangutans. We can protect the orangutans and the rainforest from palm oil destruction - but we have to act now. Time is running out! If the Commission does not carry out the commitments made by the EU parliament by February 1, 2019, orangutans may soon become extinct and more of our rainforests will be gone. For years, the EU has bowed to the pressure of biofuel lobbyists labelling and then subsidised palm oil diesel as a ‘green fuel’. In the coming weeks, they will continue to put pressure on the EU to keep and continue to subsidise dirty palm oil in our tanks for many more years. Together, we need to let the Commission know that our voices are stronger than the biofuel lobbyists and that we will not allow our forests to be destroyed and orangutans to die for cheap palm oil and ‘fake green fuels’. Destruction of large areas of forests and killing our wild life namely urangutans. Why is it important? Animals are not scum and humans are scum and need to be eradicated. I care about the plants that give us life, and the life that lives on our planet! We are killing the world and it’s beauty and unless we stop our children will suffer! Why not make more use of waste cooking oil. We use the donations to place Twitter ads for at least 875 pounds. We then check whether we think further ads make sense. Donations that we do not use directly for Twitter ads are used for our campaign work against the power of corporations and for the protection of our environment. Together we can protect the forest and save the orangutans. Sign now to get the EU Commission to stop subsidising palm oil diesel that kills orangutans and destroys our forests! We must act now - the Commission only has until February 1 to make it happen! Last week, we met with top EU Commissioners to persuade them to stop subsidising palm oil as fake ‘green fuel’. We were able to arrange this last-minute meeting only because they were impressed by the amount of tweets and signatures this petition has gained across Europe. Unfortunately they are still scared by the threats they’re receiving from palm oil lobbyists and we risk losing this vital fight. 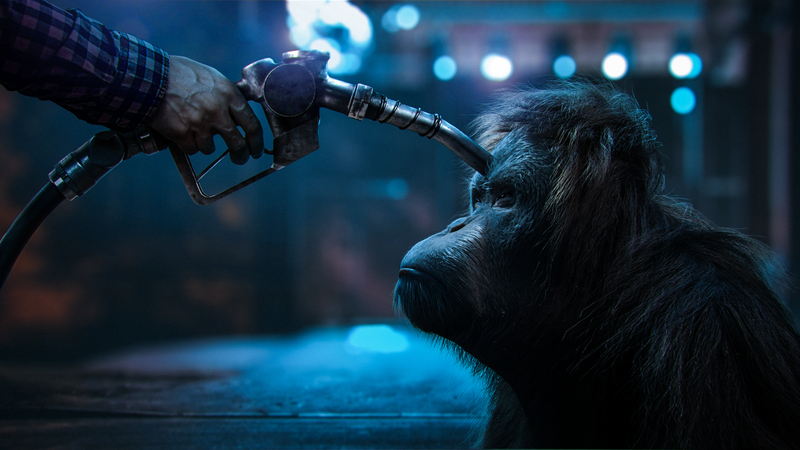 We need you to send a Tweet now to Commissioners like Malström, Cañete, Timmermans and Juncker to convince them to take palm oil out of our fuel tanks. They have to decide by tomorrow! No ape in my tank! Thank you for standing for sustainability and the environment with us. It is only together that we can truly be a force to be reckoned with.